Tungsten copper (copper tungsten, CuW, or WCu) alloy is a pseudo-alloyof tungsten and copper. As copper and tungsten are not mutually soluble, the material is composed of distinct particles of one metal dispersed in a matrix of the other one. The microstructure is therefore rather a metal matrix composite than a true alloy. Copper Tungsten alloy combines the properties of both metals, resulting in a material that is heat-resistant, ablation-resistant, highly thermally and electrically conductive, and easy to machine. Copper tungsten alloy is the composite of Tungsten and Copper, which own the excellent performances of Tungsten and Copper, such as heat-resistant, ablate-resistant, high-intensity, excellent thermal and electrical conductivity. Tungsten copper alloy is easy to be machined. Tungsten copper alloy is used widely in such industries as engine, electrical power, electron, metallurgy, spaceflight and aviation. Using CIP formation, sintered tungsten skeleton and infiltrating copper (silver) technology, large size and special shape products of tungsten copper composites with 6-90 percent of copper are produced, such as electric contacts, electrode, refractory parts, heat sinks and parts of rocket, We can also produce tungsten copper alloy sheet material, tubing, plate and other small products by mould pressing, extrusion pressing and MIM. Parts are made from the tungsten copper alloy by pressing the tungsten particles into a desired shape, sintering the compacted part, and then infiltrating with molten copper. Sheets, rods and bars of tungsten copper alloy are available as well. Commonly used copper tungsten alloy contains 10 to 50 wt. % of copper, the remaining portion being substantially all tungsten. The typical properties of the alloy depend on its composition. The alloy with less wt.% of copper has higher density, higher hardness and higher resistivity. The typical density of CuW90 alloy, with 10% of copper, is 16.75g/cm3 and 11.85g/cm3 for CuW50 alloy. CuW90 has higher hardness and resistivity of 260 HB kgf/mm2 and 6.5 µΩ.cm than CuW50. 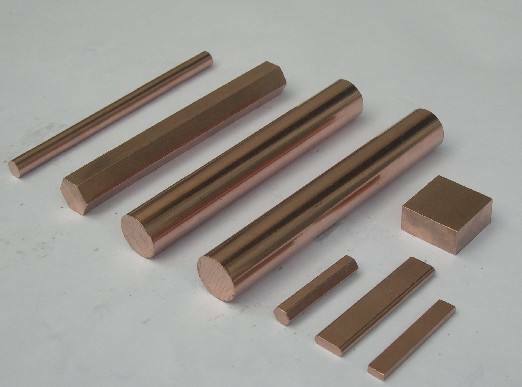 Copper tungsten alloys are used where the combination of high heat resistance, high electrical and/or thermal conductivity, and low thermal expansion are needed. Some of the applications are in electric resistance welding, as electrical contacts, and as heat sinks. As contact material the alloy is resistant to erosion by electric arc. 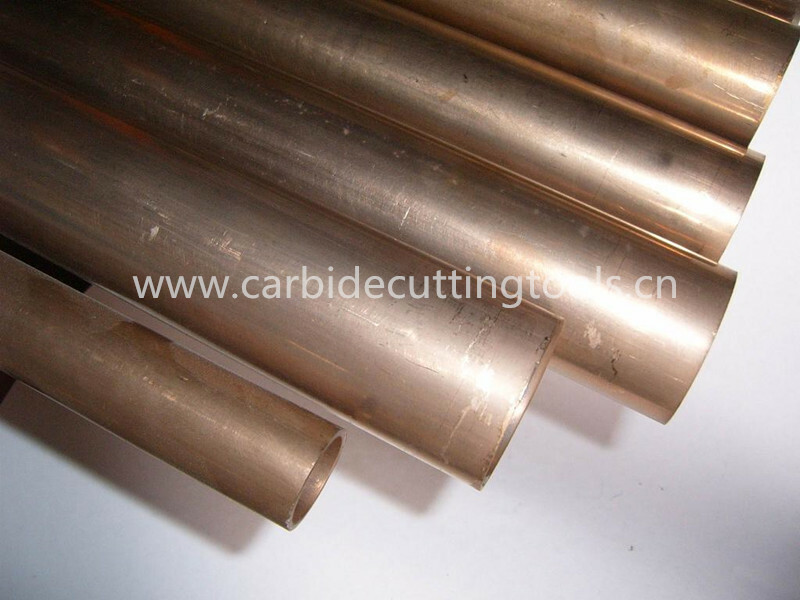 Tungsten copper alloys are also used in electrodes for electrical discharge machining and electrochemical machining. The CuW75 tungsten copper alloy, with 75% of tungsten, is widely used in chip carriers, substrates, flanges and frames for power semiconductor devices. The high thermal conductivity of copper together with the low thermal expansion of tungsten allows thermal expansion matching to silicon, gallium arsenide, and some ceramics. Copper Tungsten alloy with 70-90% of tungsten is used in liners of some specialty shaped charges. The penetration is enhanced by factor 1.3 against copper for homogeneous steel target, as both the density and the break-up time are increased. Tungsten powder based shaped charge liners are especially suitable for oil well completion. Other ductile metals can be used as binder in place of copper as well. Graphite can be added as lubricant to the powder. The manufacturing process of Tungsten copper alloy is to press the refractory (tungsten or tungsten carbide), sinter the pressed compact at a high temperature, and infiltrate with copper. All of this is done under very closely controlled conditions. The mechanical and physical properties of Tungsten copper alloy vary with composition. 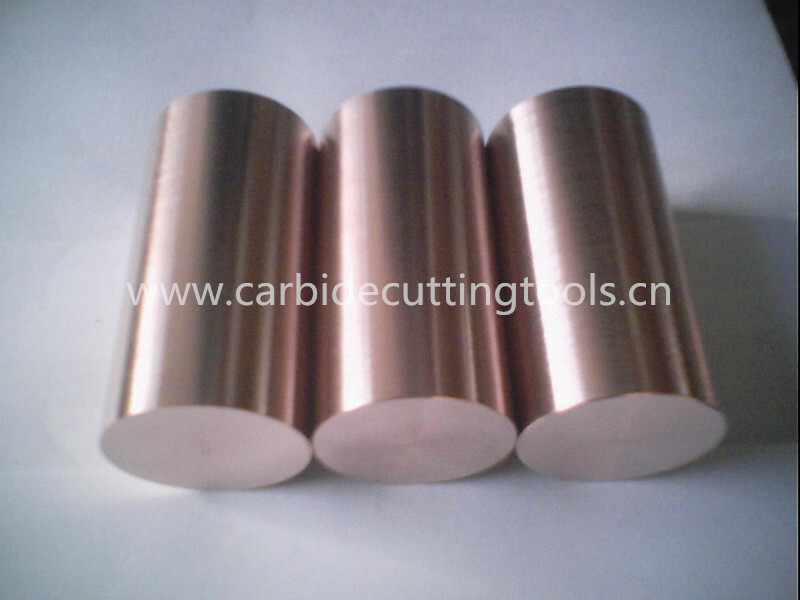 The thermal and electrical conductivity increase with the amount of copper, while the hardness, strength, and resistance to mechanical wear increase with the amount of tungsten or tungsten carbide. The application determines the material choice. All of our copper tungsten alloys are produced by the press, sinter, and infiltrate process. Each manufacturing step, including the basic powder, is closely controlled, monitored, and signed off on by Quality Assurance. After completion, all manufactured lots are checked for conductivity, density, and hardness prior to shipping. This information is recorded and kept on file, and also accompanies the parts or materials when requested. The machining and grinding characteristics of tungsten alloy are similar to those of hard grey cast iron. Being nonporous, standard water soluble coolants may be used if desired, but are not required. Each machine shop usually has its individual machining or grinding practice and, therefore, the information presented should be considered as a guide only. Tool: Carballoy, grade 883 or equivalent. Grind tools with 0 deg. rake, 8-12 deg. clearance, and .010" to .025" nose radius. The nose radius can increase with the size of the work. For fine finish, stone small flat on tool parallel to work. Suggest resting stone on work when honing tool. Turning & Boring: Roughing, approximately .030" deep and .020" per revolution feed. Finishing, .002" to.005" depth of cut and .001" to .002" per revolution feed. Turning speed, 300-500 surface feet per minute. Do not use lubricant or coolant. Shaping: Tool Speed: 43" per minute for Tungsten Copper 25% alloy. Milling: Drilling High Speed steel drills and taps may be used. Through Tapping: Holes are recommended. Material must be firmly held. Hand feed-lubricant and cutting oil acceptable. Rough Grinding: is best done with 80 grit resin bonded wheels of medium hardness; .015" per pass on Tungsten Copper 25% alloy. Use water or water soluble oil coolant. Joining: Material may be silver brazed, or copper brazed in a hydrogen atmosphere. Copper Tungsten alloy is the composite of Tungsten and Copper, which own the excellent performances of Tungsten and Copper, such as heat-resistant, ablate-resistant, high-intensity, excellent thermal and electrical conductivity. It is easy to be machined. It is used widely in such industries as engine, electrical power, electron, metallurgy, spaceflight and aviation. Using CIP formation, sintered tungsten skeleton and infiltrating copper (silver) technology, large size and special shape products of tungsten-copper (silver) composites with 6-90 percent of copper are produced, such as electric contacts, electrode, refractory parts, heat sinks and parts of rocket, We can also produce sheet material, tubing, plate and other small products by mould pressing, extrusion pressing and MIM. Tungsten copper alloys are used where the combination of high heat resistance, high electrical and/or thermal conductivity, and low thermal expansion are needed. Some of the applications are in electric resistance welding, as electrical contacts, and as heat sinks. As contact material the alloy is resistant to erosion by electric arc. WCu alloys are also used in electrodes for electrical discharge machining and electrochemical machining. The CuW75 alloy, with 75% of tungsten, is widely used in chip carriers, substrates, flanges and frames for power semiconductor devices. The high thermal conductivity of copper together with the low thermal expansion of tungsten allows thermal expansion matching to silicon, gallium arsenide, and some ceramics. Other materials for this applications are CuMo alloy, AlSiC, and Dymalloy.